Lisa Stubbs, an Australian journalist, visited my hospital in Pattaya, which is a good example of Thailand’s health care providers, and was moved to write the following article. “Most blokes take better care of their cars than their own bodywork, and often it can take a major parts failure before they consider any regular maintenance. “But an annual medical is just as essential to ongoing good health as regular servicing is to the smooth running of a motor vehicle, and combining an overseas holiday with a comprehensive check-up can be just what the doctor ordered to maintain the male machine in peak performance. “Thailand is building a reputation internationally for its preventive health care, offering comprehensive health checks that are more like a 100,000 kilometer service than the usual ‘grease and oil change’ most Australians expect of an annual medical at their local GP. “The tune-up at this hospital even comes with a patient ‘logbook’ – a health portfolio detailing the results of all the tests and doctor’s advice for follow-up treatment if necessary – to take home for future reference. “Hospital director, Dr Pichit Kangwolkij, is seeing a growing market for the Bangkok Hospital Pattaya’s check-up services, which are so highly regarded that patients are now flying in from all over the world just for an annual medical. “An annual check-up is the best way to find out if there are any hidden or insidious diseases, such as early stages of cancer, heart disease, pulmonary tuberculosis, diabetes or hypertension,” he said. “As growing numbers of Australians are discovering, medical tourism offers a world of difference in health care that goes beyond well-priced dental work and cosmetic surgery. “For not much more than the cost of a specialist consultation at home, the hospital will provide the sort of detailed check-up that is usually only available to corporate high-flyers in Australia. “This is Rolls Royce service at a Toyota price, and in the five-star hotel atmosphere of the hospital, awestruck Australians are finding they get maximum mileage for their outlay. “With all the efficiency of an Indy car pit crew, the hospital’s highly trained medical staff can provide in one morning, and under one roof, a series of specialist consultations and a battery of tests that could take months to carry out in Australia. “The most basic medical at less than $A 100 includes a chest x-ray (this alone in Australia costs around $A 90), a physical examination - blood pressure, pulse and vision test along with body mass index measurement to check the patient’s weight is proportionate to his height. “There is also an ECG, to check the heart is ticking over as it should, a urine test to check for diabetes and other health issues, and a range of blood tests covering cholesterol, kidney and liver function, and PSA levels to screen for prostate cancer. “If snoring is an issue – and it can be more of a health concern than simply a source of annoyance for a long-suffering partner – a check-up might be upgraded to include a stop-off at the ear, nose and throat specialist. “The results of the blood tests are available in an hour – in less time than some patients can spend sitting in their GP’s waiting room back in Australia. “A self-confessed ‘techno freak’, British tourist, Michael Bailey, who underwent leading-edge SuperSight surgery to profoundly improve his vision, found even the pre-op medical an eye opener in itself. “In this high-tech environment, the gentle and caring medical staff are as much a stand-out feature as the hospital’s gleaming marble interiors and chandeliers. “Thai people are known for their caring nature, and in our hospital environment, patients get a double dose of care,” said Dr Pichit. Thank you, Lisa, that was an Australian’s view of services we have come to accept as “normal”, but compared to overseas, treatments in Thailand are exceptional. 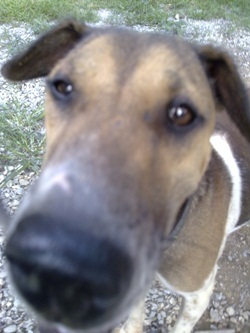 Hi, I’m Noi Nah’s sister Malagor. I’m darker than her so it’s easy to tell us apart. I also like to lead an active lifestyle and am very healthy at just 10 months old and have all my shots etc. too. We would be happy together or apart. Just come down and visit us at the shelter asap and we can go straight home! 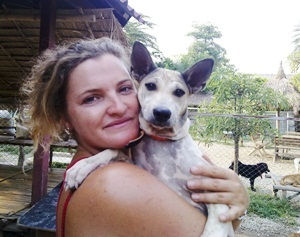 If you think either Noi Nah or Malagor could be the right one for you – contact the shelter English (08 47 52 52 55) or Thai language (08 69 13 87 01) to make an appointment to meet them at the shelter, e-mail: [email protected] or visit the website for further information. I’m Noi Nah, I’m just about year old and I’d love someone to take me home. I need an active lifestyle but I also like settling down for cuddles with my favourite people. I am a lovely healthy little girl with bright eyes and a short tan and white coat that won’t need any grooming! I have all my shots and am sterilised. If you really want to have some fun you can adopt me and my sister Malagor (below) together, we look similar and like alot of the same thing. P.S The woman in the shot with me would like you all to know that she is not up for adoption at this time. I think the maid at work has taken a shine to me. Big smiles every day, and she likes to spend time cleaning around my desk and rests her hand on my shoulder while I am sitting there, and wants to chat with me. I thought I might be imagining all this, but the other day I came in and my desk had been cleaned and tidied, with a little note to say she had done it for me. This is all very sweet, but I am happy with my Thai GF and don’t need another one. How do I let her down gently? All you have to do is be polite, but don’t encourage her. When she comes to clean around your desk, get up and go to the rest room. She will get the message without your being rude to her. You sound like a nice person, so I can see why she would be attracted to you. Shame you’ve already got a Thai GF, I could be tempted to clean up your desk myself. What do I do about my girl who won’t stop working in the bar, even though I have offered to set her up in a nice little condo and pay her a wage of 30,000 baht a month for the nine months I am away? I reckon it’s a pretty good deal, but she doesn’t want it, always making excuses and then saying we’ll talk about it next time I come over. When I say I want her out of the bar and she doesn’t have to work, she says 30,000 isn’t enough. I’m confused. Are they all like this? This is the best one I have ever found, but I’m stymied. What’s the answer Hillary? The short answer is ‘run away’ my Petal. Her feelings for you are not the same as your feelings for her. Not all girls who work in a bar are like this, but this one is probably more honest than many others. Rather than take your money she has stated her preference quite plainly. For all you know, she may already be receiving “wages” from other foreign visitors. And more than you are offering. Not unheard of, you know! Once a week I have a night out with the boys at work. Usually this means I get home in the wee small hours (2 a.m. most days) and sometimes I am a little the worse for wear as a couple of the lads are top drinkers. My girlfriend is starting to crack up a bit about this one night a week. I reckon she is being unreasonable, as I used to get home even later before the crackdowns in the past year. What can I tell her to make her see that this is just harmless fun with the lads and is a break for me from family responsibilities? I want you to change roles with your girlfriend for one night. She is going to go out with the girls from work and is going to come home at something past two, decidedly the worse for wear. In other words, very drunk. Are you going to sit back happily and let this happen every week? Will you happily sit at home and not wonder where she is? Will you sit there calmly watching TV soap operas about cheating husbands and wives and not worry (that’s all there is on Thai TV unfortunately)? Or are you going to crack up about it? It is only Scottish stags that are the “monarchs of the glen”. I think you should reconsider your responsibilities to the young lady. And some people told me that chauvinism was dead! I am on a long stay holiday here in Thailand, and I must say that I have been made very welcome by everyone. After getting more than slightly tipsy the other evening, I wonder if you could advise me on the alcohol content of some of the local brews? During the night in question which began at 6.30 p.m. I only had four pints of Heineken Draught, followed by a couple of Tigers and two Leos. I shared in a bottle of some white wine with my father and my stepmother and followed that up with another two Leos. This was over six hours but I suddenly began to feel ill and my ability on the pool table decreased so much that my father beat me. My question is, should I have stuck to one brand, or should I only go by the percent alcohol? As I write this, the following morning, I have a large headache, so I need to know the answer as soon as possible please. A couple of weeks ago, I began with the following - I do not claim to be an expert in shooting video, but there are certain aspects that are true for all types of photography. Let us begin with one very important fact. Still photography freezes a moment in time, while video photography tells a moving picture story. Try not to shoot ‘stills’ with a video camera and your videos will start to look professional immediately. 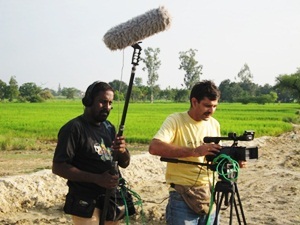 Video work, however, is much like still camera work - the results you get will depend upon your knowledge of technique, and your ability to work out “how” to produce the images you want. Here are a few more “rules” which can help you produce better video. Firstly, no rule is absolute, but you should have a good reason to break it. Having said that, let’s look at a few basics. Just like still photography, make the subject the ‘hero’. Fill the entire screen with your important subject matter. Look at the TV soaps if you want to see how to fill up the TV screen. Empty space is wasted space. Your video camera is recording ‘real’ life, and in real life, walls are vertical, doors are upright and horizons are horizontal. Avoid the ‘arty’ effect of strange angles. One way to do this is to use a tripod. While tripods are very effective pieces of equipment for still photography, I think they should almost be mandatory for the amateur videographer. Another area that is often neglected in the excitement of the shoot is the background. If it is disturbing for you while you are shooting, it will be worse for the people who will watch your video later. Movements and bright lights, cars going past, people walking through the scene, stopping, gawking - they are all distractions and detractions. It is better to stop filming and move somewhere without the confusion behind your principal subjects. You can solve most background problems by moving the subject, the camera or changing the angle of view. Always check the distracting background details. You can’t get rid of them after the shot has been recorded. Since the majority of your videos will include people, there are a few recommendations here too. When shooting people, place the subject’s eyes one-third down from the top of the frame no matter the type of shot. It is that old rule of thirds again. Dead central is dead boring! Another shot to avoid is one with large distances between people. Again, look at the soaps on TV. The people are really standing much closer than they would in real life (in each other’s personal space in fact), but if you have them a meter or so apart, you lose ‘contact’ in the video. You should also shoot people in full or three-quarter profile to let the viewers see both eyes. The one eyed effect does not look good. Again, look at TV. When two people are talking, the camera shoots over the shoulder of person one to shoot the second person face-on to the camera. When the first person replies, the shot is taken the other way, over the shoulder of the second person. You can also take shots of the person who is listening to the other speak. These are sometimes called ‘noddies’, because the person will be nodding while listening to the other speaker. Video is in color and you should always remember the impact that color has on any shot. The most important thing is that your viewer’s attention is drawn to the most colorful areas of the scene. To avoid visual distractions, you must be on the lookout for colorful objects which may divert the attention of your audience. Either have the brightest colors or lights in the shot area that is the focus of attention, or get them right away altogether. The same rule goes for light and dark areas on the screen. If you place a dark subject next to a bright object, your viewers will look at the brighter area even though the dark subject is the main center of interest. And I am not talking about the weather. The economists in the world knew there was something wrong years ago but reverted to the age old tack of get the consumer to spend and the problem will just go away. However, they did begin to raise eyebrows when oil passed USD150 per barrel. Even the optimists figured something was not quite right and worked out that if this was maintained there would not be enough petrol left for everyone. Put it another way, there is not enough oil on the planet to allow American-like consumption for all 6.8 billion of us. This did not produce the headlines it should have done. In fact, it was only the good old Wall Street Journal that pointed out there could be further problems which are presently hidden. It also threw up this little tidbit: If the markets could force Greece to promise to slash its deficit then why could they not do this to other western countries like America, UK, France, etc? Things look grim. It is not one problem but many. It is not just Greece and the other aforementioned countries but potentially most of the western world. We have demographics not seen for centuries where an older population keeps getting older and the younger generation is not keeping pace with it; i.e., less are paying for more. Sometime soon, we will not be able to pay for pensions and other costs that governments are continually committed to. Let’s not stop there but continue with the realism. There is not enough potable water in the world to go around and, as seen above, energy is not getting any cheaper. The prices for these and other essential consumables will keep going up. We now a have looming catastrophe with cash as the only people who are making any money out of the Quantitative Easing (QE) are the bankers who are making it very difficult for people to actually get the money required for growth. This therefore begs the question, if the hoped for recovery is dependent of people being able to borrow what will the outcome be if the lenders refuse to give it to you? Before answering this let us look at the largest economy the world has ever known. Ever since the end of World War II, America has been the place where people buy, buy, buy. It has created wealth for the rest of the world and most, if not all, emerging markets have counted on this to expand and grow their manufacturing base. The same goes for resources. Over the last half century most America has imported more resources than anyone else. What now though? As has been seen from holiday sales results, Americans do not have the purchasing power they once had. It is not surprising really; it had to end sometime and with what has happened over the last couple of years it is not a shock it has occurred now. However, what is interesting is that the American buyer has managed to keep buying for so long. As reported recently by Agora Finance, the average worker in the US was earning USD325 per week in 1973. This year, when taking inflation into account, this amount is now only USD275. So, he is earning less but buying more? How? Credit is the word you are looking for. Americans wanted things and when it got too expensive to make it themselves they paid others to do it. They had more than they could dream of and are now, literally, paying for it. This and also the fact the US as a country has imported more and more and made less and less. A couple of years ago the trade gap was almost USD900 billion. What does this mean to the rest of the world? Well, now that the people of the emerging markets are closing the gap it could mean a lot. These people save more and work longer hours for a lot less money. However, they are now in a position to be able to buy more as well. This is all good for their economies but not for America as they are also dubious about the US Dollar. These countries have not really needed emergency QE whereas most of the old world economies are in the process of going bankrupt. What are the politicians doing about it? Throwing more and more money at it! This is not the answer. The solution is unpleasant and painful but, as can be seen by what has happened in Germany, the short, sharp agony gets it over and done with quickly and efficiently. What to do? Cut public spending in all sectors. More of Europe later. That wonderful old sage Dr. Marc Faber said recently in a TV interview that the present financial crisis has been caused by “excessive credit growth”. Although the private sector has, generally, managed to adjust and reduced leverage it has been overshadowed by the world’s governments non-stop spending. Amazingly, the total credit of the American economy, as a percentage of the US economy is still growing. Officially, when you compare now to the Great Depression, the debt to GDP is 375%. It should be noted that in 1929, it was only 186% and, in those days there was no Medicare, Medicaid, Freddie Mac, Fannie Mae etc. If you include these then the debt to GDP ratio is over 600%! This is physically impossible to maintain. If you carry on printing money then the fiscal deficit will go up and, as mentioned above, the interest rates will rise as well. This will mean the interest payments on the governmental debt will mushroom and in a few years time these payments alone will be nearly 50% of US tax revenues. As Dr. Faber says, if they want to get out of this mess then they will have to “monetize”, create yet more stimulus packages and this will lead to high inflation and so reduce the standard of living. Recently I recommended movies by ‘best of their genre’ and last week I saw two of those again, available at Chiang Mai’s DVD Film and Music shop at Suthep Road. The re-viewings confirmed that they have stood the test of time like all great works of art should. This is partly because both are directed by cinematic masters (with uneven outputs) capable of directing without undue flourish or bravura. The films start with almost mundane simplicity, establishing the situations against which the strong dramas and emotions unfold. Both have quite conventional story lines, dominated by takes on ‘revenge’, below which Lang and Aldrich delve to plumb the depths of human existence. A warning; I might have written depravity and evil, rather than existence. Being more specific would have highlighted the grim reality presented. Lang’s noirish view of despair is very much in line with other works, notably his best American film Fury, which might have served as a film title here. 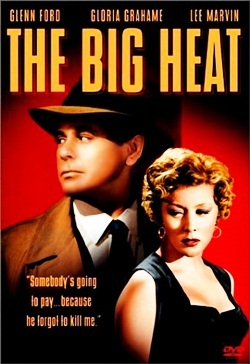 The setting is mid-fifties U.S.A. where a dedicated cop (Glenn Ford) works – somewhat truculently – in a force he knows to be corrupt and in the pockets of a big time gangster. When his wife is killed by the mob he embarks on a one man mission to rid the city of its scum. Along the way people get hurt, some hideously, but the man is driven by forces beyond anyone’s comprehension. Banyon, the cop, quiet and loving, has been transformed into an avenging fury with feelings like tempered steel. Nothing matters, even his likely death, and as such he is the precursor of many an inferior film’s hero. Like Spencer Tracy in Fury he has died ‘inside’ and like the pathetic murderer in Lang’s M he awaits some kind of salvation. Aldrich like his contemporary, the equally variable Nicholas Ray, was a great Hollywood maverick who occasionally worked well in the system. His best movies, including Autumn Leaves, Kiss Me Deadly, Twilight’s Last Gleaming and this western, are genre pieces. In Ulzana he enjoys a fine and literate but never literary screenplay by Alan Sharp, written during the death throes of America’s war against Vietnam and turns it into a harsh and melancholy view of the seemingly inexplicable clash of cultures. A clash understood only by the scout McIntosh and not by the young army lieutenant (son of a preacher) whose mission is to lead the horse soldiers to capture or kill Ulzana and his band of Apaches. Like Lang, Aldrich sets the cosy background. In this case an army fort (not suburban bliss) and then lets loose the dogs of war. What the troopers are about to meet is the inexplicable and only the scout (Burt Lancaster at his majestic best) accepts that the inexplicable is just that. He does not try to ‘understand’, but accepts the horrors, the danger and acts accordingly. Hopefully, he says, in anticipation of disaster. The lieutenant (a perfectly cast Bruce Davison) is thrown into a baptism of fire. Few films have depicted the cruelties of conflicts with such appalling directness. The journey in search of Ulzana and his braves is akin to Banyon’s in that it can only end in death(s) and the odyssey is one of power and complexity. The movies offer a wonderful comparison in technique, rhythm and style. Lang, like such fellow Europeans as Billy Wilder, Douglas Sirk and Max Ophuls, works classically within the frame. Enticing us in so that nothing exists beyond the fluid series of images with which we are confronted. They offer us a confined, intense world. Aldrich, like Ray and John Ford and the incomparable Howard Hawks suggests a wider world, hinting at complexities and possibilities outside the ‘frame’. A more ‘exterior’ view of the world, less intense and ‘interior’. You pay your money and make your choice. I’m greedy, I want both. Robin Hood: US, Action/ Drama – Robin Hood as gladiator, brought to life by Russell Crowe, all grunting and scowling. There are lots of swashes buckled and swords clanked. This re-visit to Sherwood’s most famous forest is brought to you by Ridley Scott, responsible for Alien and Gladiator. It’s something of an origin story, finding historical context by telling of Hood’s early days as an archer in the service of King Richard, before he became the man in tights redistributing the crown’s wealth. The Airport Plaza version has digital sound and image in their Cinema 3. Early reviews: Generally favorable. The Bounty Hunter: US, Action/ Comedy – Gerard Butler plays a down-on-his-luck bounty hunter who gets his dream job when he is assigned to track down his bail-jumping ex-wife (Jennifer Aniston). Complications, as they say, ensue. Critics say the two leads are as attractive as ever, but the script doesn’t know what to do with them. Generally unfavorable reviews. A Nightmare on Elm Street: US, Fantasy/ Horror –. A group of suburban teenagers share one common bond: they are all being stalked by Freddy Krueger, a horribly disfigured killer who hunts them in their dreams. As long as they stay awake, they’re okay. Critics have not been kind to this remake, saying that it lives up to its title in the worst possible way. They say it’s visually faithful but lacking the depth and subversive twists that made the original so memorable. Rated R in the US for strong bloody horror violence, disturbing images, terror, and language. 18+ in Thailand. Generally unfavorable reviews. Ong-Bak 3: Thai, Action – Tony Jaa in the historical martial-arts conclusion of the two-part prequel to the Ong-Bak movie that made him a star in 2003. Rated 18+ in Thailand. It’s sickeningly violent. I really object to the level of masochism displayed by Tony Jaa in his latest film. It really is too much. For a good half hour at the beginning he is tortured over and over until he’s lifeless, then revived and tortured some more, until his body is a broken, bleeding near-corpse. This is truly alien to me, and I object to what he expects me as an audience member to put up with. We’re not all as sadistic as Jaa is masochistic. It seems personal. I’m sure his tortures reflect the way he feels his critics have treated him, and the boss at the film studio that withheld the money to finish Ong-Bak 2. I wouldn’t be at all surprised if the chief torturer bears a remarkable physical resemblance to the studio head. When he finally recovers from the maulings and mutilation, and gets revenge, I feel like he’s fantasizing getting back at all his real-life perceived enemies. Aside from some Buddhist nonsense and the torture, the picture is fascinating. Jaa is a true artist, and has expanded the form of the martial arts film in unforeseen ways, incorporating not only many strands of martial arts disciplines, but also many strands of Thai culture, and its dances and rituals and meditational poses. He again incorporates traditional palace dance forms into this film, probably to the dismay of action junkies. He is endlessly inventive, and brings unsurpassed energy, athleticism, and zeal to his projects. And the films, which always have their surreal qualities, are exceptional works of art. He’s working out his own inner demons through his art, especially his revenge fantasies for all his own real-life real or imagined slights, but that’s what artists do. Ip Man 2: Hong Kong, Action/ Biography/ History – The second in a trilogy of semi-biographical martial arts films based on the life of Ip Man (1893-1972), a grandmaster of the martial art Wing Chun. One of his students was Bruce Lee. The film focuses on events in Ip’s life that took place in the city of Foshan during the Second Sino-Japanese War, as Ip Man grew up in a China torn by racial hatred, nationalistic strife, and warfare. This biopic from director Wilson Yip dramatizes Ip’s life story. Thai-dubbed only, and only at Airport Plaza. Iron Man 2: US, Action/ Adventure/ Sci-Fi/ Thriller – Directed by Jon Favreau, starring Robert Downey Jr. It isn’t quite the breath of fresh air that Iron Man was, but this sequel comes close, with solid performances and an action-packed plot. Both theaters also have a Thai-dubbed version. Mixed or average reviews. Furry Vengeance: US, Comedy/ Family – A real estate developer moves his family from Chicago to Oregon when his job calls for him to oversee the building of a major housing development. But once there he faces a unique group of protesters: local woodland creatures who don’t want their homes disturbed. Look forward to 92 minutes of abuse from a stupid and mean-spirited movie that’s one of the worst in recent memory. Generally unfavorable reviews: 25/25 out of 100. This remarkable double slam swing from the English Bridge Union Easter Festival of Bridge was reported by Andrew Robson. 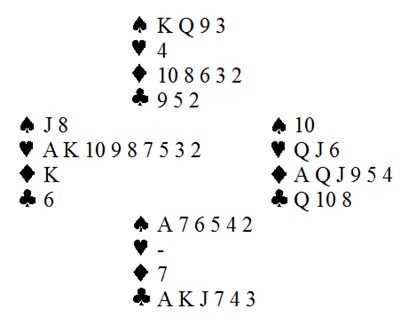 The hands and the bidding at Table One are shown below. East dealt and East-West were vulnerable. North’s jump to 3S was preemptive. David Bakshi, sitting South, knew he was going to 6S as soon as his partner showed spade support. However he hoped to deceive the opposition about the very distributional nature of his hand by pretending to be interested in how many aces his partner had and bidding Blackwood. Eventually he got to 6S and East doubled. West knew that a heart would be ruffed, so led the king of diamonds instead. East overtook and led a heart, which was trumped. Declarer pulled trumps, finishing in dummy, ruffed a diamond to find out more about West’s distribution (singleton diamond). Then he cashed one high club, crossed to dummy with another trump, and led a club. Now for the critical decision—finesse for the queen of clubs or go for the drop? Eventually he decided that West’s jump to 6H was more consistent with a very long suit and short clubs and decided to finesse. Doubled small slam made by North-South for 1210 points. Now let’s see what happened at Table 2. The bidding is shown below. South went to 6S as soon as he heard about North’s spade support. West, hearing South’s confident bid and thinking his hand useless for defence, decided to sacrifice in 7H. South doubled for penalties. North interpreted South’s double as Lightner, asking for an unusual lead, normally dummy’s first bid suit. Looking at his hand he thought South was void in diamonds and led one. West won in hand with the king, pulled the trump (singular) ending on board and played top diamonds to throw away his black suit losers. The defence went to bed with their two black aces. Doubled grand slam made by East-West for 2470 points, for a total swing between the two tables of 3680 points! Is it just me, or is it hot around here? While a relative newbie to Chiang Mai, I have spent many years in Thailand, albeit in more temperate climes than this. I understood that Chiang Mai got hot in the summer. But I guess the realization of just how hot that really was and hot completely will sapping it could be could only be experienced. Everyone I have talked to, and we all talk about the heat, thankfully below 40 today, has been astonished at not only the temperatures, but also the length of time the extreme heat has been hitting the North. The Meteorological Department is warning about the heat wave and the heat exhaustion and heat stroke that can go result from high temperatures.. Loose clothing, a hat, and plenty of water help but really its best to just stay out of the sun during the heat of the day. I drive a motorbike and have refrained from driving in the middle of the day as my head feels like its boiling away inside an egg cup. The heat has made people tired, listless and some a bit cranky. That is, when they can muster up enough energy to act cranky. Heat and drought go hand in hand. We’ve had a couple of nice rains the past few days (and for that I am grateful, even just a couple of degrees lower and I feel remarkably cheery) but the drought is quite severe and, with a lower than average rainfall last rainy season and higher than average temperatures, has reduced many farmers to desperate straits. There are reports that 30 cows died in Mae Hong Son due to lack of feed from the drought. And while 30 cows may not seem like much, I am sure to the owners it is a devastating loss, probably one they cannot afford since they clearly couldn’t afford to even buy feed for their cows. This year has been an El Nino year.. The El Nino pattern results in high temperatures and low rainfalls in Asia and heavy rainfall and storms in the Americas. It is most obviously noted by the very high water temperatures off the equatorial Pacfic Asia, and lower than normal equatorial water temperatures in the Americas. Meteorologists have reported a pattern of weakening of the El Nino, and hope to have a neutral pattern (ENSO) by June. There is, however, a possibility that it could then shift to a La Nina, where the pattern reverses and Asia sees heavy rains and increased typhoons and the Americas sees drought. Seems we can’t win either coming or going with the weather this year. The use of artificial and potentially hazardous chemicals should be abandoned in home gardens, where none of us depend on perfect roses, lawns or fruits for our survival. In commercial gardens we can be more forgiving, as the absence of a crop may crush the economy of an entire family. However, selection of compounds and amounts of compunds used should always be made by an educated mind. A promising trend is the increasing interest in organic foods, both here in Thailand and abroad. This demands that we are prepared to pay more for a smaller product. Quite often we hear rumours that organic food is in fact not organic at all. I guess an organic farmer bordering a farm with chemical pesticide management will inevitably have traces on his products, which is why it is important that such reports put the traces found into comparison with dangerous levels. Also, you can make a visit to an organic farm. If every leaf looks perfect, you have a reason to be suspicious, but if you see holes in the leaves after insect bites, the farm might be truly organic. It is also wise to chat with the staff. A couple of times an owner has praised his organic products, while my Thai wife told me with a giggle afterwards that the staff told her they have orders to spray like mad in the evenings. Be aware that many nurseries spray their ornamental plants with strong pesticides, because we, the buyers, won’t pay 50 Baht for a Hibsiscus with a hole in the leaf. What seems to be currently lacking, is an organisation that makes random and unannounced visits to farms to check if they follow organic standards. Such an organisation could have a stamp, and buyers would know that products with that stamp are reliable. As such standards and organisations already occur in Europe, we can simply adopt their guidelines and routines and get started. Are any of the Chiang Mai Mail’s Thai readers interested? www.dokmaigarden.co.th. Once upon a time, when the world seemed a nicer place, two young lads were sent away to different but equally posh and equally expensive schools. Too expensive for ordinary people of course, but not for the very grand and well heeled who do not mind spending the equivalent of a British family’s yearly income on one son’s schooling. In fact that amount of money (29,000 pounds, well over 40,000 dollars or one and a half million baht) would feed a Burmese family for 100 years. And that’s maybe why revolutions happen. But that is another story. And not make believe. These nice boys met up much later and had very different views about life, partly because one came from a cosmopolitan family and went to the better school and the other was conventionally brain washed. Even so they were quite drawn to each other, if only because of their posh backgrounds and accents. After all, money talks. And often rather well, don’t you think? Each pursued successful careers and the conventional one was even more successful because he hung around with old school friends and had them over for drinks and many of them helped him in his business affairs where he’d had a stroke of luck: the competition was so feeble and he’d become head honcho and was called Posh One. The second did well but because he was a little more sophisticated (and had even married a high flying foreign woman who was richer and more posh than he was) had not quite the same level of acceptance. If his wife had not been so rich and clever, it would have been even more of a problem, since being even a little exotic is frowned upon by the British, especially their right wing press. Years after their happy (and ‘expensive but worth it, don’t you think?’) schooldays, the boys had the chance of going into business together, taking over a once thriving restaurant that had fallen on hard times during a recession. The problem was that Posh One was a raging carnivore, who even approved of people hunting for their own food and killing anything that they could find. He loved succulent flesh and fowl and fish and thought “let them eat cake’ was one of the wittier sayings uttered by a queen. He also believed implicitly in top tables for top people. Posh Two on the other hand was distinctly a veggie and didn’t like killing things and wanted a more egalitarian eating place. He would have been happier working with the restaurant’s former boss, who, although not a strict veggie, cared about animal welfare, free range food and even looked after old animals past their usefulness by keeping them warm in winter. He was the old fashioned type, a bit dour and not called farmer Brown for nothing. He was not at all posh and lots of people found him odd because his parents had not paid for him to go to school. He too had a nice intelligent wife, like posh Dave and little Nick, but she didn’t earn nearly as much as the other wives and often did charity work, which was also thought a bit odd. So Posh Two went along first to the man he felt socially comfortable with (‘class will out, don’t you think?’) thinking, wrongly, that opportunity knocks twice. And he forgot that he didn’t believe in hunting animals with trident spears, and forgot about letting caged birds free, and decided that animals did not need more space. He forgot about compassion and even about the future and the fact that one day -with farmer Brown- he would have a partnership in the business, which was only fair since he was bringing a large share of capital into the venture. More than he was being given credit for. But silliest of all, he did not remember that Posh One had learned from the ruthless and cruel wicked witch of Grantham or that posh people don’t respect other people, even if they too are posh. They may not despise them as much, but they don’t necessarily respect them, especially if they think of them as wimps. They don’t bother to keep promises made in the heat of a business courtship, anymore than they recall promises made to the fags at school, who cleaned their hand made shoes. So the veggie soon found that juicy steaks were on the menu and the only customers were rich, posh people who had blood dripping down their ample chins. And the restaurant was renamed the Bulligham in memory of the good old days, which were happily here again. But not for long, since within about a year all sorts of problems arose and the restaurant could not work with those two owners tugging in different directions. So they put it up for sale again. The other version of this story is that Farmer Brown heads off for pastures new in the House of Lords and Posh Two sees the light and opens up with Brown’s associates, the compassionate farmers. And Posh One cries and cries: all the way to the bank. 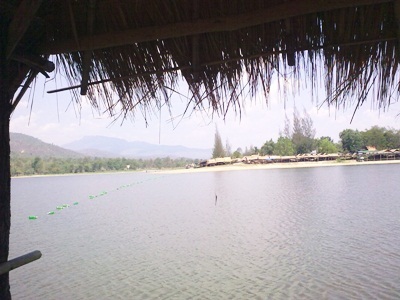 A short 15-20 minute drive out of central Chiang Mai, will take you to the scenic and relaxing Huay Tung Tao Reservoir. At just 20 baht per person you can enter the grounds at this beautiful manmade lake and enjoy a number of activities, or, if you prefer to relax, just do nothing at all. The water itself is apparently really quite clean, and is popular for swimming. There are also paddle boats, picnic areas, fishing, fresh food, massage, and even off road driving! There is also a camping ground for those who wish to stay over. If you feel like relaxing, then I suggest heading for one of the bamboo huts which are built on the lake. Someone will come and take your drinks order (and food, if feeling hungry) and bring it to you. There are also the occasional passing seller offering snacks, fresh fruit, and knickknacks. I suggest dangling your feet over the edge and into the water to cool you down a bit. The water is surprisingly cool. Early mornings are a good opportunity for bird watchers. Early evenings are a great time to watch the sun set. 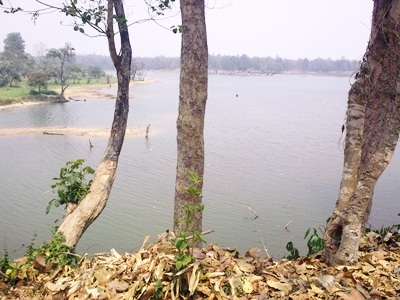 The lake itself, and its surrounding land, was donated by the Royal Family to serve as a tourist destination. You will find it along the 121, just beyond the 700 Year Stadium. Enjoy!